With its gabled roof and location next to the village green, the Woodstock Inn gives the illusion of having occupied that site since early in the town's history. Although there was a tavern on this spot as long ago as 1793, the current building dates to 1969, when Laurance S. Rockefeller—the man behind the Mauna Kea Beach Hotel and Caneel Bay, among other notable projects—demolished its predecessor and replaced it with a 142-room retreat in classic Vermont style. At once homey and elegant, it invites plopping down in one of the sofas or chairs facing the cavernous lobby fireplace, strolling through the gardens behind, or grabbing a drink and listening to live music in Richardson's Tavern, which was named for the man who first built on the property. All of that contributes to the pleasure of staying at the inn, but ultimately what sets it apart from its peers is its deep trove of resort amenities, including an expansive Woodstock Athletic Club, an historic 18-hole golf course, and a 10,000-square-foot spa. It may look and feel like and inn but it has the amenities of a resort. Contributing to the allure is Woodstock itself, a picturesque village of historic houses, covered bridges, quaint shops and galleries, that classic village green, and even a national park. 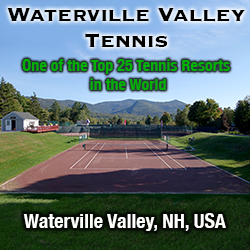 With six clay and four hard courts outdoors and a pair of hard courts indoors, the Inn has one of the larger tennis facilities in Vermont. They are part of that expansive Athletic Club, which is located 1.4 miles from the inn. There tennis players not only have access to courts but also to a well-equipped fitness center, indoor lap pool, aerobics facilities, saunas, steam and whirlpools. The depth of these facilities on their own makes this club stand out, but Rockefeller treated the interiors to the same attention to detail he lavished on the inn. The two-story reception area has a flagstone floor, wood paneling and beams, and wood-burning fireplace. The outdoor courts beyond has been scattered in pairs across a broad lawn studded with trees and backdropped by a stream and wooded hillside. There are even wooden beams supporting the roof of the indoor court. It is a delightful place to hang out. Tennis Staff. Adri Atkinson directs operations. Orignally from South Africa, where she played on the national junior team, she then came to the U.S. and was an All American at Delta State University, a Division II school in Cleveland, MS, where she earned a Bachelor in Fine Arts. 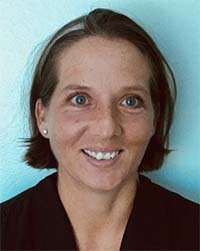 After graduation, she joined Peter Burwash International (PBI), directing programs at the Hilton Guam Resort and Spa, Bio-Hotel Stanglwirt in Austria, and Florida's Naples Grande Beach Resort before coming to Woodstock in August of 2018. Tennis Programs. During the summer months when the outdoor courts are playable, the weekly roster has some sort of activity almost every day, including introductory clinics, round robins, intro to pickleball, little kids tennis, and King Kong Cardio, the last a heart-pounding 2½-hour Cardio session. Courts & Fees. There are six clay and four hard courts outdoors (two of those now devoted to pickleball) and two hard courts indoors. Court fees: $32/court for guests; higher rates for others. Golf Courses. The Inn boasts the oldest golf course in Vermont. It dates to 1895, not long after the original Woodstock Inn was built, but was redesigned in the 1960s by Robert Trent Jones, Sr. Set in the scenic Kedron Valley, the 6,000-yar, Par 70 course is riddled with sand traps and water hazards. Spa. The newest addition to the Woodstock Inn creature comforts is its 10,000-square-foot spa, a sun-drenched retreat with high-ceilings and abundant windows and Vermont-inspired treatments. And ... In addition to its other facilities, the fitness center has basketball and volleyball courts, while the inn adds Orvis fly-fishing lesson, and a school of falconry. The Woodstock area itself contributes options for biking, hiking, canoeing, kayaking, fishing, and swimming while in winter there is downhill and cross-country skiing, the latter in the area behind the fitness center. Recent renovations have the 142 guest rooms and suites looking better than ever, hand-dyed wool blankets, wooden furnishings, and original Vermont artwork, while the suites add fireplaces. There are several dining options, include the Red Rooster, which emphasizes local ingredients, and Richardson's Tavern. Seasons. Outdoor tennis begins in mid May and extends into October, weather permitting. Travel Instructions. The Inn is a 20-minute drive from the municipal airport (LEB) in Lebanon, New Hampshire, which has commuter service from Boston, New York City, and Burlington, VT.
General Tourist Information. Visit the Vermont Department of Tourism and Marketing website or contact them at 6 Baldwin Street, Drawer 33, Montpelier, VT 05633-1301; Phone 800-VERMONT (800-837-6668). Here's what others have had to say about Woodstock Inn & Resort.